Pet Emergency? Call us right away at (952) 758-2881! At New Prague Veterinary Clinic we provide a complete range of animal care services, from annual exams and routine surgeries, to more complex diagnostic procedures. 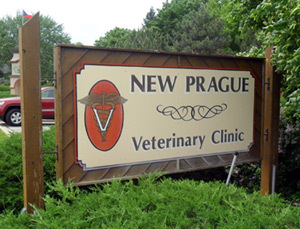 Our veterinarians, Dr. Bill Vollmar and Dr. Katie Vollmar are both natives of New Prague. For more than 100 years the Vollmar family has taken care of area pets and we look forward to caring for your pets for years to come! As pet owners ourselves we understand how important your furry family members are and we provide more than just great quality care, we offer a wealth of knowledge about area pet care gathered from generations of experience right here in New Prague. Walk-ins Welcome after 10 a.m.! Dr. Bill Vollmar has been practicing in the area since 1981. He is the third generation of veterinarians in the Vollmar family. Dr. Katie Vollmar, graduated from the University of Illinois in May 2017. She now practices veterinary medicine as the fourth generation of her family to do so, at New Prague Veterinary Clinic. "I love this vet clinic. Sadly I moved away with my cats and they don't like travel, but if I ever move back to the New Prague area he will be my regular vet again." "Clean well maintained place to bring your pets, the staff is invested in the well being of your pets health care." "Very caring vet at good prices." "I have a cat who is scared of men and was abused before I got her so her anxiety is horrible. The staff and vet were so amazing that she didn't even cry. They were so good with her. Plus they order her special food in for us!!" "Doc Vollmar is awesome. He's very knowledgeable and has a real love of animals."